Ontario Premier Doug Ford and Saskatchewan Premier Scott Moe released a joint statement on Thursday (July 19) where they agreed to fight federal carbon tax following the Ontario government cancelling more than 750 renewable energy contracts. Renewable energy stocks continue to slide down on the TSX and TSXV with Ontario Premier Doug Ford overlooking climate change. Premier Ford and Saskatchewan Premier Scott Moe released a joint statement on Thursday (July 19) where they agreed to fight federal carbon tax. The two premiers said that they will work together to stop federal government from imposing taxes on their people. “This type of taxation does nothing for the environment and hits people in the wallet in order to fund big government initiatives,” Ford and Moe said in the release. Thursday’s announcement follows what has been a hard week for renewable energy companies as over 750 contracts were cancelled by the Ontario government on Friday (July 13). Ford struck to his campaign pledge of winding down contracts that are in pre-construction phases with his government on Friday publishing a list of 758 contracts that would be affected. Shares of several Canadian cleantech companies including Polaris (TSX:PIF) and Etrion Corporation (TSX:ETX) were down over five percent during the five-day period. Pattern Energy (TSX:PEGI) was down over three percent while TransAtla Renewables (TSX:RNW) was down two percent. Atlantic Power (TSX:ATP), Hydro One (TSX:H) and Boralex (TSX:BLX) were some of the other companies that recorded loses. Greg Rickford, Minister of Energy, Northern Development and Mines said in the statement on Friday that ratepayers of Ontario would benefit CS$790 million in savings due to the winding down of these contracts. “We clearly promised we would cancel these unnecessary and wasteful energy projects as part of our plan to cut hydro rates by 12 per cent for families, farmers and small businesses,” Rickford said in the press release. Prior to Friday’s announcement, the Ontario government on July 11 said that the CEO of Hydro One along with the entire of board of directors will be stepping down. “I gave my word that the CEO and Board of Hydro One would be gone. Today, I kept my promise to the people. The CEO and the Board are done. We’re going to reduce hydro prices by 12%, so people don’t have to choose between heating their homes or putting food on the table,” Ford said in a tweet. Several organizations have expressed their disappointments following the string of announcements by Ontario. Canadian Solar Industries Association (CanSIA) in a press release said that the cancellation of renewable energy contracts would undermine investor’s confidence in Ontario. Further, the firm forecasted 6,000 job losses. Meanwhile, the Canadian Wind Energy Association (CanWEA) highlighted that the wind energy is the lowest-cost option for electricity supply in Canada and around the world. While the political climate in Ontario might not be strong for renewable energy, the overall market trend remains positive both in Canada and in North America. 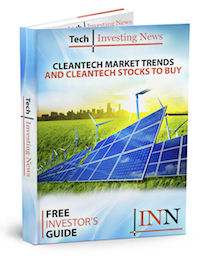 As noted in the Investing News Network’s (INN) cleantech Q2 2018 update, the sector remains an exciting space for investors in Q3 and beyond. Several Canadian cleantech stocks also witnessed a significant share price increase on the TSX at the halfway mark of the year.